A simple and effective heating solution for all types of drums; particularly plastic containers. suitable for a standard 210 litre capacity drum/ container. Recommended as high power flexible heating jacket for demanding applications with plastic, fibre or metal containers, where more heat input is required than can be obtained from our standard range. 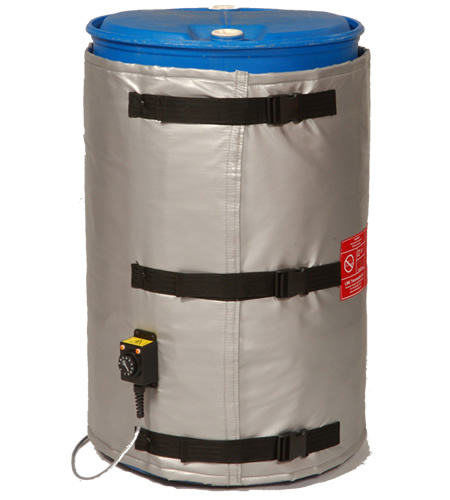 The heating jacket (210l) is manufactured from lightweight but resilient materials and fitted with adjustable quick release buckles for ease of installation and removal. Temperature is regulated via a built-in thermostat up to a maximum of 90°C for plastic drums. Jackets with higher power ratings and 0-120°C thermostat can be manufactured for use with metal drums. Applications include viscous or semi-solid materials in plastic drums, liquids stored in steel drums housed in unheated areas, sample testing at elevated temperatures, and time critical container heating. Silicone rubber coated glass cloth material rated for temperatures to 180ºC. Unique, extra chemically resistant polymer coating available as an option. Stitch bonded fibreglass insulation for significant heat retention properties. Adjustable thermostat: 0-180ºC or 0-90ºC range.